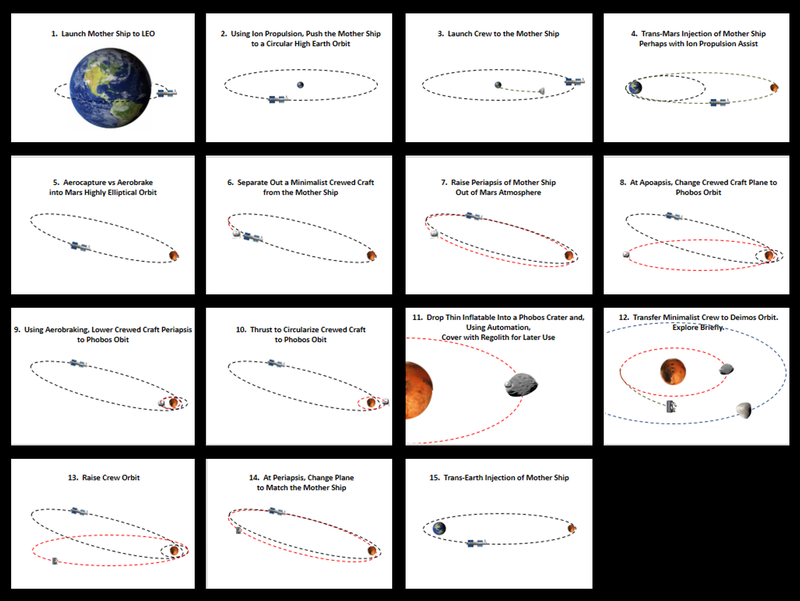 The Plan for Sustainable Space Development proposes that, while the Moon is undergoing cost-effective development, the first steps to Mars should not be delayed but in fact should be accelerated. This can be done because the "Lunar COTS" approach to lunar development should not exceed 7% of NASA's budget. This should allow more than enough budgetary space to allow for the initial, in-space steps to Mars provided that modest efforts be made to reduce the cost of going to Mars. Alternately, NASA's budget could be increased 7% to open up the funds necessary for Lunar COTS. The key is to start with the in-space steps to Mars. 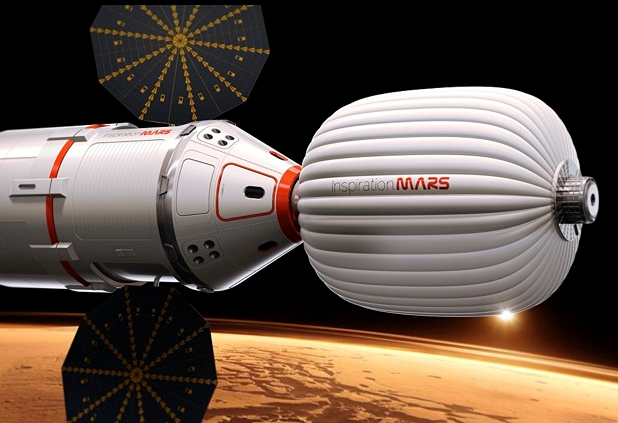 In particular, the priority for Mars should be to determine what are the minimal requirements for conducting a Mars flyby mission within the earliest possible timeframe. Neither a lander, nor the ability to stop in the Mars system, nor the ability to conduct missions for 2.5 years are necessary. For a mission lasting about 590 days, even a solution for microgravity is necessary. 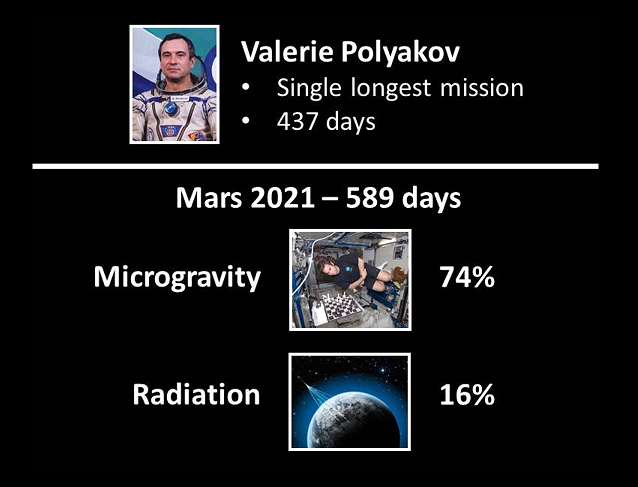 Indeed, the Soviet cosmonaut, Valerie Polyakov, spent 74% of the 590 days on the Mir and he is doing fine today. However, what we need to conduct such a mission are the launcher, capsule, in-space habitat, a solution for space radiation, and most critically, the ability to keep the systems reliably functioning for that length of time. This may well require that the entire system be tested in the space between the Earth and Moon, outside of our magnetosphere, for the full length of the Mars mission. If something goes wrong, then the crew are a safe three-day trip from home. Data indicate that a modest amount of hydrogen-containing material (e.g. provisions or polyethylene) around the crew's sedentary quarters area would provide enough shielding to protect against solar flares while keeping the crew well within their career radiation limits. The second step to Mars should be a mission to the two moons of Mars -- Phobos and Deimos (PhD). Although this mission also wouldn't require a lander. This would be a more demanding mission in that it would last for the entire duration of a Mars surface mission and expose the crew to as much radiation as a full surface mission. It would also push the crew to a level of microgravity exposure well beyond what we have experience with. Tethering and spin-up would be a fairly easy solution to the later problem. Hydrogen-containing shielding would still keep the crew within their career limits. So, a combined PhD mission would be a good intermediat step. 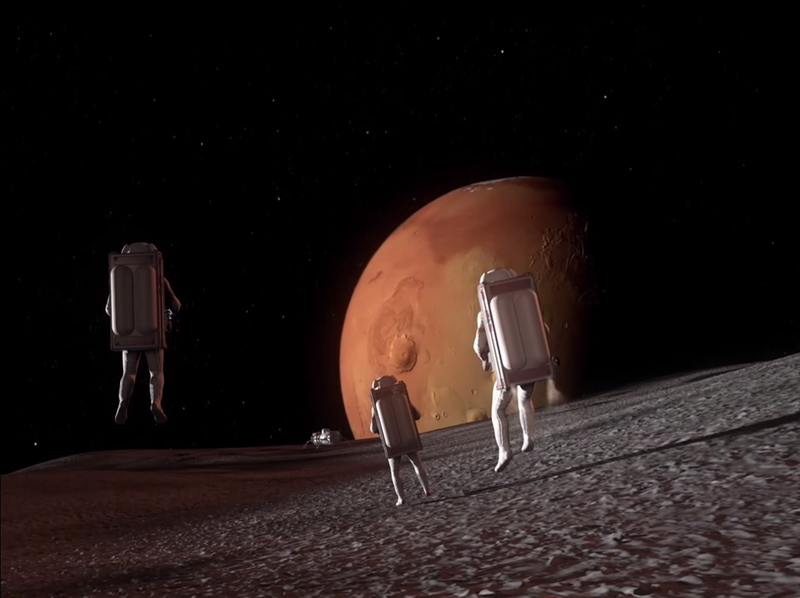 Imagine what it would be like for the crew to hover over the surface of Phobos in a type of jet pack -- circumnavigating that moon and watching as Mars writ large rose from the horizon. Phobos may contain rocks which had been previously kicked up from the surface of Mars. With the short distance from Phobos to Mars, near real-time control of robots on the surface of Mars would be possible. Rather than emphasizing the telerobotic scientific exploration of Mars, the Plan proposed that the crew operate the robots to set up a shielded habitat on the surface of Mars as a way of ensuring that we take the next step -- sending humans to the surface of Mars since their habitat would have been set up and awaiting. the initial steps to Mars.